There are several ways to brew your own beer. Ambitious would-be brewers can make the leap and buy all the equipment, investing in a system designed to brew not just one batch but many. Shops like Modern Homebrew Emporium in Cambridge are happy to help. If brewing seems like more of an experience than a lifestyle, it might make sense to make your beer at a brew-on-premise site. Barleycorn’s Craft Brew in Natick and Hopsters in Newton both do the heavy lifting, inviting you to select a style and brew under the supervision of a professional. The beer stays on site, and you come back two weeks later to bottle it, label it, and take it home. The two different options lead to a common result: a lot of beer, usually a case or two, of whatever style you chose to make. If you bought your own brewing equipment, there’s also the question of where to put it. A five-gallon fermenter takes up a lot of room in a studio apartment. A take-home brewing kit from the online Brooklyn Brew Shop tries to address both problems. For $40, would-be brewers get everything they need minus a pot, a strainer, and a stovetop. The equipment comes in a box smaller than something that might hold a toaster. Complete the brewing process and you get a gallon of beer, enough to fill about 10 bottles (which you purchase separately). 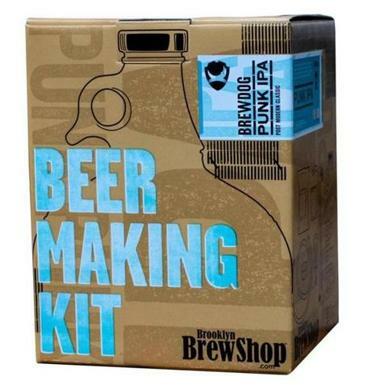 Each kit comes with a recipe for a specific beer, the latest of which is for Punk IPA, from the Scottish brewery BrewDog. The same hops used by the professional brewers are tucked into the box in vacuum-sealed packages.